ABS construction with shatterproof magnifying lens. Includes snap-on - snap-off flotation top and 36" rope leash with anchor plate. Indicated when pond temperature is safe to feed koi and goldfish. 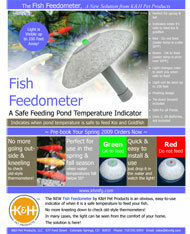 No more pond-side kneelin... Just drop in the water and watch the light- Green, ok to feed; Red, do not feed. Light can be seen from 100' away. Floats with tie-down lanyard included. Uses 2 AA batteries (not included).